What do you have of true value? On a recent episode of Doctor Who, The Doctor and his companion found themselves on a planet where the currency was items of value. Not just any material thing, but a photo, keepsake, or heirloom that held sentimental value to the owner. The more memories tied to an item, the more valuable it was. The premise of this planet's monetary system made me think about how many things of actual value I have. Not monetary value, but sentimental value. I have plenty of "stuff," but how much of it do I really value? I have a handful of pieces of jewelry from my grandmother that I deeply value, because they are from her. I don't know if they are valuable on the open market, but I hold them close to my heart. 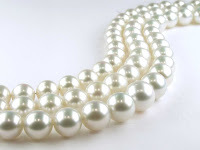 I have a real pearl necklace from my mother that she gave me on my wedding day. I have a scrapbook that I used to keep with actual printed out pictures and decorations that I did myself on each page. I have a box full of all the notes and cards my husband has given me in our time together. Those are some things that I truly value, things that are irreplaceable. Looking at this list makes me re-think all the gadgets I just have to have, or the make-up or hair products I think I can't do without. I have so much stuff, but 99% of it doesn't hold true value to me, so why do I have it? I guess we as people are innately gatherers. We like stuff. We like the fill the crevices of our homes because...we can? What do you have that you truly value? My grandmother's engagement ring is a huge value to me. Also, many letters from Lynn...I also value the Bible I got when I got baptized. The spine on that Bible is broken, the pages are overly highlighted, but it truly reflects the journey I've been on since I got it. Oh my gosh, I have a letter that Lynn wrote that someone gave me at her funeral. It is so precious to me. Funny, but I think the one item I own that I hold more dear to me is an old ratty teddy bear that my Dad bought for me when I was a kid. There are other things, but that's the most sentimental thing. I'm pretty sure I still have all my stuffed animals from childhood. I don't know what to do with them, but I can't get rid of them!